Excellent proximity to the Santa Rosa Clubhouse with this Tuscan facade Monterey plan, including stamped concrete courtyard, detached casita, and 3 bedrooms, 3 baths totaling 1,965 square feet of interior living space. 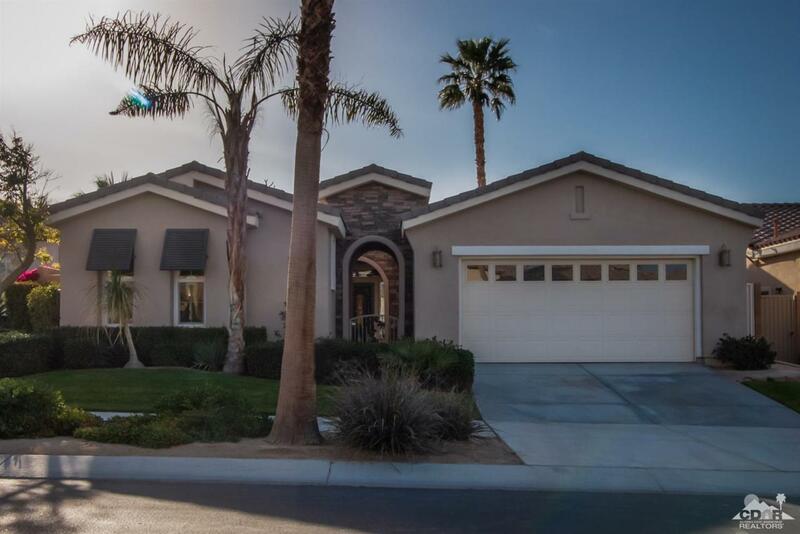 This Trilogy La Quinta single story residence also includes a formal dining room/den/4th bedroom, great room with large TV niche and surround sound. Open concept kitchen includes white appliances, double ovens, built-in microwave, gas cooktop, granite counters and plenty of cabinetry. Guest quarters w/laminate wood flooring and adjacent bath. Master retreat w/en suite bath including bay window, walk-in closet, dual vanity and spacious shower. Individual laundry room, leading to the 2 car extened garage, has mounted cabinets and full sink. Detached casita is perfect for offering family and friends privacy. Soothing rock waterfall feature in the backyard is on spot for outdoor entertaining on the large deck, while enjoying the professional landscape scheme.